things can look like they require close to no continuous progress over this full period, but it is not the case since I have decided to set off with a tough program to reach desired state as soon as possible and then remain at this stage or better. 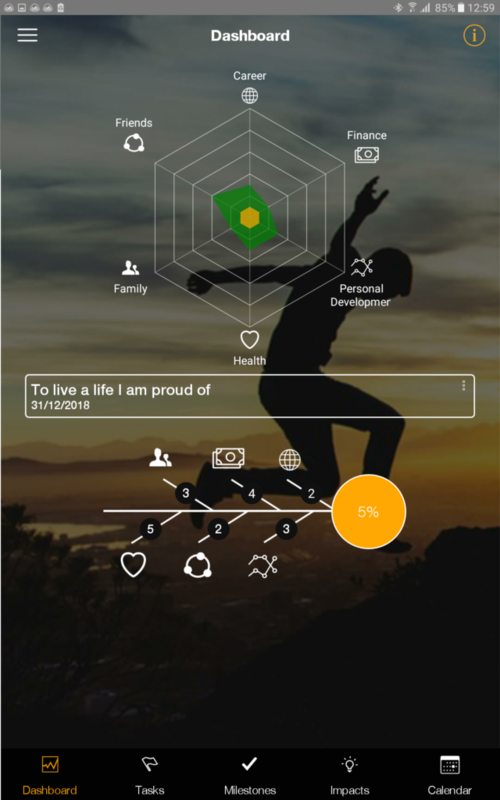 I am confident that you will understand my point when you see process I made for my journey – to become a better me with best goal setting app. For me to be able to say that I live a life I am proud of there are several things which must be in place. Let’s take a closer look at them broken down in the six areas, and please understand that some of the elements are already in place but must just as well be described to provide me a full image of the state of reaching my goal. It is also important to keep in mind that there will be more elements that describes the situation where I have reached my goal, at this stage I simply identify the important ones I manage to identify now. I should be in a much better physical condition than my current state, and I must lose at least 6 kg – and maintain this weight loss. I should live an active life with five or more sessions of exercise every week. In the nutritional aspects, I should eat fish at least three times every week and more than 50% of my dinner plate should be vegetables. I should reduce snacks and chocolate to weekends or special occasions. When it comes to alcohol I should be able to stop drinking after three units when I have worked the following day. I should be able to get at least 7 hours of sleep six out of seven days in average. In the mental aspects of my health I should be in balance. This might sound like a cliché but being in balance will be a great leap forward for the current me, which is impatient, gets easily angry, and can identify myself with most stress related indicators. This is an area that should be in a state where I understand and comply with their needs in a common base of mutual respect. There should be a clear understanding of what I expect from them towards me and vice versa. Spending time with my family should increase energy to me in the same way it should be perceived that I give to them. I am present and focused in the moment when I am with my family and not distant in other thoughts. My friends should be prioritized to the extent that I manage to maintain a balance. I should have knowledge of those who are in my close circle and those that are not and prioritize accordingly. Friends are important and friendships requires effort to be maintained, I understand this and comply to the effort with great joy as it give and I provide energy to the collaboration of my friendship circle. I have a clear understanding of my good friends and energy consumers and manage to treat them thereby. Always with respect. My finances should be predictable and at a state where I manage to pay my bills and set some money aside in savings. I am confident about my financial situation. I stand behind the products the company I work for and provide to the market with a strong belief that the products provide real value to our customers. I work under the presumption that even though I am well aware that nothing is forever, this is the best place for me now. I conduct specific exercises to overcome my fears. I live to overcome my dreams. I live by the rule: “if it doesn’t challenge you, it won’t change you”. Keep in mind that “You don’t know your limits until you push yourself past them”. 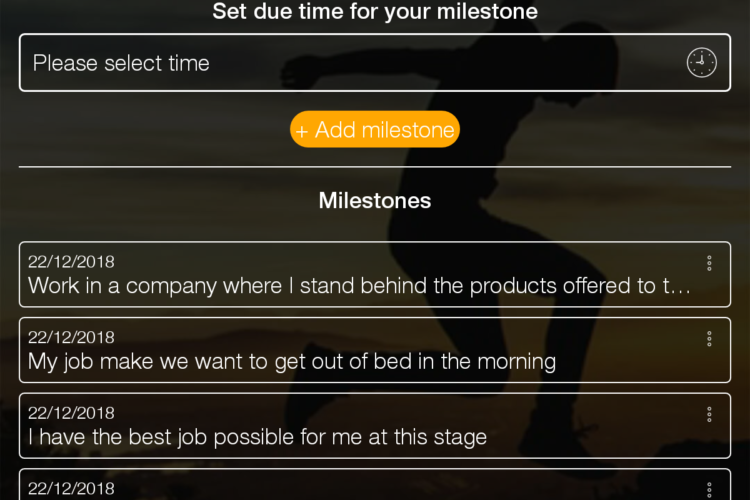 So, there you are, I have managed to generate a good set of milestones that implies what my life looks like when I am close to reach my goal. It is important to understand and remember that there might be things that change during my journey towards my goal, except from my goal: To live a life I am proud of. They say: “A goal without a plan is just a wish”, I agree to this. I have managed to set my goal, identify obstacles and driving factors, been through the Whitmore check, done a self-assessment and defined milestones that will prove to myself that I am about to reach my goal (when I get there) with best goal setting app, it is about the time to work on the tasks I must commence in order to get this journey started. Fortunately, when you have defined a goal that really thrives you to this is fun. The best thing is that even though this will require sacrifices, the gain of reaching the goal surpasses all sacrifices big time. The distance between your dreams and reality are called focus and discipline, it is about time to walk your talk – are you ready to commence? The common factor for me is to make sure that I hold a complete understanding of my current situation and thus one task that will come repeatedly is to get understanding of my status. I prefer to spend a little more time on this now and get an accurate picture rather than having to adjust later due a to poorly analysis of my own situation. This is my choice and not at all the required strategy to utilize the app. Here is an overview of the tasks I have come up with at this stage. In the following, you will see them broken into each area. This screen is good to have when I work with a goal for as long as I do. For every area I can see how many active tasks I currently have, if any of those are overdue it will be shown in the red number. But also it is possible for me to see the number of tasks I have completed my journey to accomplish my goal, and that will boost my energy to move forward. The most important thing here is to admit to the fact that the road ahead of me requires severe changes in several areas. In the physical training area, I need to build up a training development. For the summer period, I should be able to comply to three active session every week. Activities include everything that increases pulse for more than 45 minutes or muscular training. Activities are set to be: running, gym, kayaking, long power walks (Milestone that should be defined). Weekly activities are set every Sunday for the week coming based on location and facilities (Task definitions). By the end of October 2017 I should be able to conduct five training sessions of 45 minutes or more every week, no matter my work or travel itinerary (Milestone). I have only set up some initial tasks at this stage as I know there will be adjustments in the early stages. The first task I put up was to make weekly training program every Sunday evening. This is a repeat task that comes up every Sunday and thus I do not have to think about weekly training program for more than one week, which is good for me now that the summer is coming and I am not always sure of the training possibilities. Make a plan for spending time with friends. Identify whether the things you are doing are short term benefits or long term gain. Do you currently have a job that can fulfil your goals in this regards? And there you have it, my personal definition, evaluation and developing plan for the next 19 months. I promise I will work according to this plan as best I can and I will of course share my development and experiences with you. 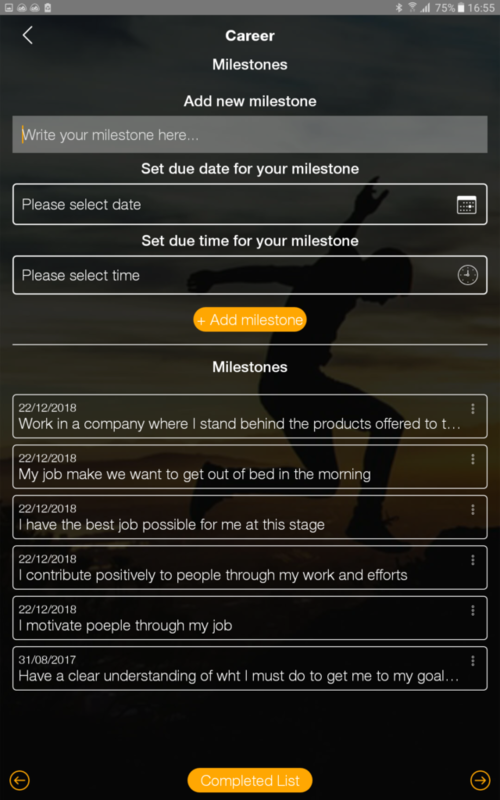 I trust that the philosophy our NoLimit-app – the best goal tracking app is built upon do provide results. PQM is a development of TQM, which is proven to be one of the strongest strategic management tools in modern history. I know that results come from discipline and focus, and this sharing will strengthen my discipline and focus. I am confident that I will achieve my goal, and most important thing is my life will be so much better to me when I am at the stage of my defined goal. 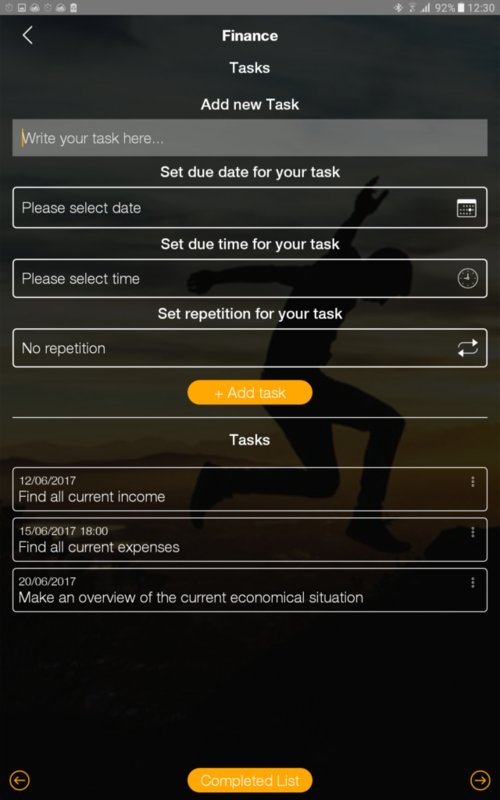 Please note that the percentage number is an indicator of how many of the written tasks you have completed, which means that when you add tasks to your journey and complete more tasks than this number will change. It is dynamic and show your status at this point of time. I encourage you to make your own goals and find your pathway to improvement. If you have any questions or constructive feedback I sincerely hope you will initiate contact with us, we are a small organization but strive to uphold good customer relations and will of course reply to you as soon as possible. With this initial blog posts where I am sharing my personal use of the app I have built I sincerely hope you will follow me on my journey as well as making your own journey. We consider creating a closed environment for NoLimit-app users where it is possible to share experiences in a controlled system (my experiences will be open for all public). Please let us know if you are interested if it is of interest for you users to share in a closed environment.